Aspiring medical assistants should be able to find the education they need in Nebraska, where numerous schools stand ready to help them achieve the goals of getting the right training and certification. In Nebraska, the administration of medication is a regulated activity. Those who want to take their career further can also become a medication aide in the state, allowing them to broaden their scope of practice as a medical assistant. Learning more about the education required is the first step, and understanding what to expect after graduation is the second step. Starting a new care in the health care industry can be as simple as taking the classes that lead to a degree or certificate in medical assisting. With today’s aging population, medical assistants are needed to help ease the burden for physicians and other health care professionals. They help with patient examinations and take care of patient scheduling and chart maintenance. First, you’ll need to do the research and find the program that’s right for your needs. 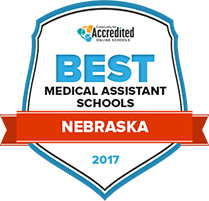 To help you get started, we’ve identified the Best Nebraska Schools for Medical Assisting in 2017. See who made the cut below. The medical assistant certificate program at Metropolitan Community College runs for about one year. The program includes an externship, a practical assignment that takes one quarter to finish. All time required to complete the externship takes place during the day. Before students can start taking classes, they need an acceptance letter from the Office of Health and Public Services. Each person who wants to enroll in the college's medical assisting program must meet with an advisor before they submit an application. To be successful during and after the program, students are encouraged to be patient, strong communicators, caring and accountable. Most of the medical assisting classes at Central Community College are taught at the school's Hastings campus. It is possible to take some of the classes online. Classes in subjects like medical ethics and law, laboratory techniques and procedures, pharmacology and medical office prepare students to work in ambulatory health center environments. The college's medical assisting certificate is a robust one year training program. At the more advanced level is the Associate of Applied Science in Medical Assisting. By taking and passing the AMA certification test, students could strengthen their academic standing in prospective employers' eyes. How are medical assistants defined in Nebraska? Medical assistants in Nebraska are considered unlicensed personnel. They are not regulated, licensed or controlled by the state of Nebraska, and there is no scope of practice clearly delineated for medical assistants. Medical assistants can perform any tasks that are delegated to them by licensed healthcare professionals, however, provided that no license is required to perform the tasks. Those who want to be able to administer medications must become a medication aide in Nebraska. Technically, certification is not required by the state of Nebraska. However, many employers do prefer certification, as it conveys a minimum amount of skills and knowledge on the part of the applicant. In some instances, insurance held by a physician could require the hiring of only certified medical assistants. For this reason, many medical assistants choose to become certified. Medical assistants in Nebraska can become certified as shown below, if they attend a medical assistant program approved by the certification agency. Check with any schools you're considering to see what certification agencies have approved them. In order to become certified in Nebraska, medical assistants must first graduate from an accredited medical assisting program. In addition, those who want to be allowed to administer medications can become a medication aide, which some medical assistants choose to do. This process requires completing a 40-hour course and passing an examination. Are there tasks outside the scope of medical assistants in Nebraska? Medical assistants in Nebraska cannot administer medication unless they are registered as a medication aide. In addition, medical assistants cannot perform tasks that are not delegated to them by licensed professionals. They cannot perform tasks that would normally require a license, such as starting intravenous lines, performing triage or writing prescriptions. Medical assistants in Nebraska make a median wage on a close par with those in other areas of the nation. The following chart goes more in-depth. Salaries for medical assistants can vary depending upon several factors; one of those factors is geographic location. Where someone works in a state often determines the rate of pay they might receive. The chart below details what a medical assistant might expect to make in various areas of the state. Nebraska anticipates an additional 150 job openings for medical assistants each year from 2012 to 2022, according to Projections Central. The following chart offers more information on employment trends in the state. Nebraska students have several medical assisting programs to choose from. Our list of accredited assisting schools is not exhaustive, but it does offer an opportunity for students to check out a few programs and get a feel for what programs are offered and what certification exams students are prepped for. After completing the medical assisting program, students will be ready to take the Certified Medical Assistant exam. Learning can be done at the student's pace, with certain classes available online. The medical assisting diploma program takes about 18-24 months to complete. Students also have the option of turning their diploma into an associate's degree by using the credits they obtained in the diploma program. Central Community College's medical assisting program is a hybrid, allowing students to take classes on campus and online. After completing the necessary coursework, students will be ready to take the exam to become Certified Medical Assistants. This page from the Nebraska Department of Health and Human Services details the requirements to be eligible to administer medication in the state. Nebraska's nursing delegation regulations concerning tasks a nurse may delegate to an unlicensed medical professional, such as a medical assistant. Serving as Nebraska's AAMA affiliate, the Nebraska Society of Medical Assistants works to educate others in the benefit of the Certified Medical Assistant certification, as well as help other medical assistants further their professional goals. Nebraska Nursing News: What Can a Medical Assistant Do? This article from the Fall 2012 issue of Nursing News focuses on what medical assistants in Nebraska are allowed to do, and how nurses should handle delegation issues.